Today, we’re answering the important question of… how to make an amazing salad. But first, let’s talk about the inspiration behind today’s post. 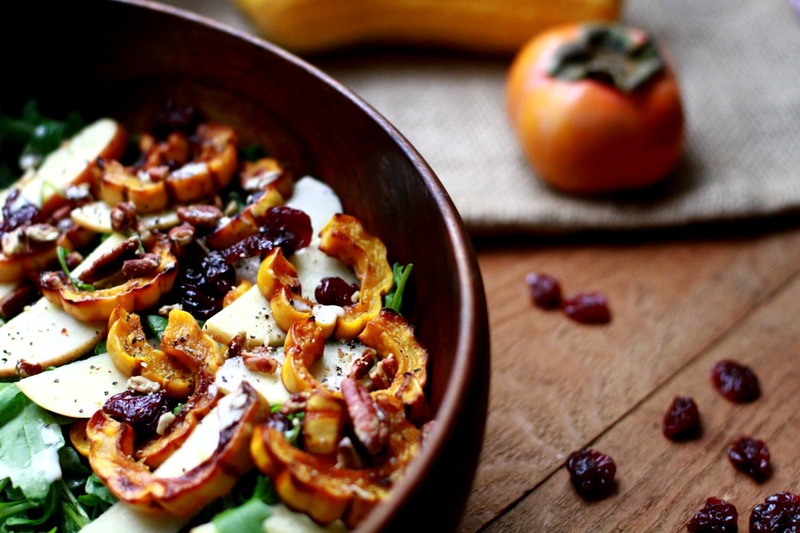 Why is it so important to make an amazing salad? Isn’t simply eating your leafy greens enough? Here’s the issue: I see you. 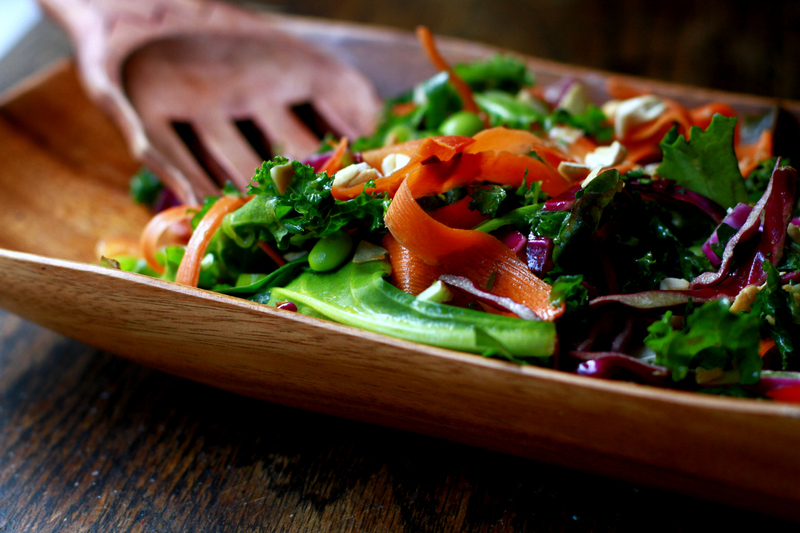 You want to eat more salad — and you have been eating salads more regularly — yay! You go to lunch and order a caesar salad because it seems like a safe option, and because every restaurant seems to have one. Or, you order a Cobb. And even though you feel good about eating more leafy greens, you’re thinking the bacon and blue cheese part isn’t really helping in the wellness department. Or, you plunk down the same boxed-greens-and-grocery-store-dressing every night because you know you should be eating your veggies, but the whole thing just seems so, well… joyless. Well, we’re about to fix all of that in today’s post. I’m going to introduce you to one of my favorite new salads — a salad that’s sure to bust you out of your salad rut — the Thai Chopped Salad with a Ginger Lime Vinaigrette. And, along the way, we’ll talk about what it takes to make an amazing salad. 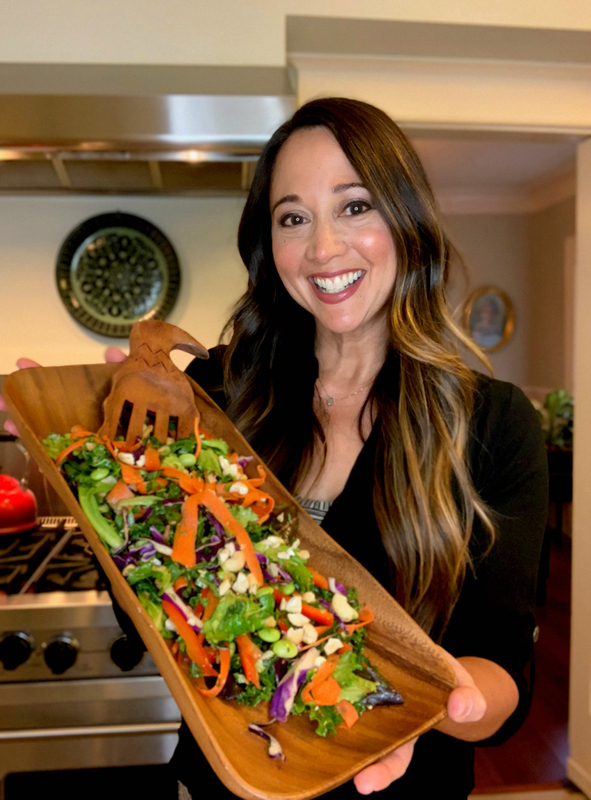 To see me make the Thai Chopped Salad step-by-step, check out the video below. This may be stating the obvious, but you need to start with the best leafy greens you can get your hands on. After all, the greens are the foundation of the salad, so they can’t be wilted, wimpy, limp, or slimy. Which can happen often with boxed or packaged greens. Case in point: those bagged greens at Trader Joe’s — the ones that are within a day or two of the “best enjoyed by” date. I know they seem convenient and easy, but I can’t tell you how many Trader Joe’s greens I’ve had to throw away because they weren’t remotely salad-worthy. Here’s a fun surprise: the best greens will likely be the cheapest greens, ounce for ounce. Just head to the grocery store and pick through the different kinds of lettuce until you find the sturdiest, healthiest looking variety. In winter — as it is now as I write this — I like to go with green or red leaf lettuce. However… life can get busy, and I often get boxed greens as well. Especially since this time of year, I can’t usually find loose arugula or baby lettuce. So, I just keep looking at the best-by dates until I find the freshest box. And then I use that lettuce within a day or two. Because there’s nothing ickier than catching a whiff of rot when you empty your greens into the salad bowl. You might not want to hear this one, but it’s a game-changer. Trust me: making your own salad dressing will change the way you see (and taste) salads forever. And you know what? Even if you’re in a rush, even simply drizzling your greens with a good olive oil and some nice balsamic vinegar will be a vast improvement on what you can find in store-bought dressings, which are full of unhealthy fats (canola oil, etc. ), artificially “natural” flavorings, and preservatives. 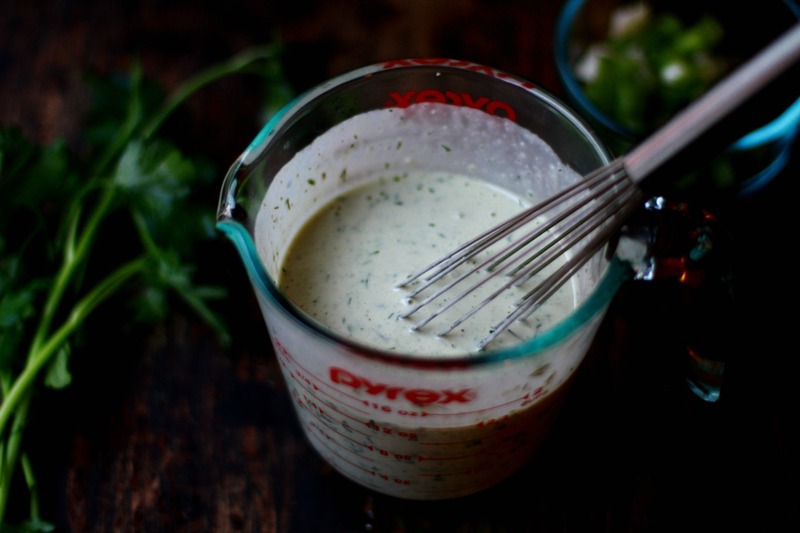 Here’s the key to homemade salad dressing: make a batch on Sunday, and you’ll have delicious dressing all week long. It’ll be as easy as having ready-made, store-bought dressing in the fridge, except it’ll taste a thousand times better. And, guess what? It only takes about 3 minutes to make! This tip is your go-to when you find yourself eating (and maybe dreading) the same salad over and over again. This tactic can also come in handy when you’re making a salad for a dinner party or potluck — you know, when you want to spice things up a bit and make the salad feel special. To make a truly amazing salad, you’ll want to introduce the unexpected. For example, if you always throw some sunflower seeds on top of salad, switch to pistachios, or even chopped peanuts. Or, get some heat involved, such as using some of the brine from pickled jalapenos (see recipe for Jalapeno Vinaigrette above). If you always use dried cranberries, switch over to chopped dates, or golden raisins. Or the superfood golden berries. Or use fresh blueberries, which are amazing on a salad. Sometimes, even the strangest combinations can yield salad magic, such as Molly Wizenberg’s arugula salad with bittersweet chocolate shavings. 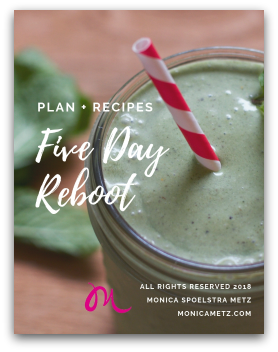 If you want to check it out, see her book A Homemade Life. The Thai Chopped Salad from today’s video combines all sorts of unexpected flavors: chopped peanuts (or cashews), fresh ginger, fresh lime juice, edamame beans, toasted coconut, and chopped cilantro. Talk about surprising the palate! This unusual combination makes the Thai Chopped Salad a major crowd-pleaser. I hope these tips help you bring a sense of fun and adventure — and added deliciousness — to your salads. So here’s to creating your own amazing salad. Please let me know how things go by tagging me on Instagram. I’d love to hear from you!